So, you really want a pet bird. So much in fact, that you've already picked out a name, chosen a location for your pet's cage, and scoured the internet for information on your favorite species. While you might think that you are quite well prepared to dive into the world of bird ownership, there are many aspects of keeping a bird that most owners don't find out about until after they've purchased one -- and most of the time, they wish they had known beforehand. Read on for some insight into what it really takes to care for a bird on a daily basis. You may be shocked to find that inviting a feathered friend into your life may require a few lifestyle changes on your behalf! You may need new cookware. Teflon or non-stick cookware can be fatal to parrots and other pet birds. The coating gives off an odorless fume when heated that can kill a bird within minutes. This means that any non-stick cookware you may own will have to go, and you will need to invest in pots and pans made of stainless steel or another safe substance. Say goodbye to candles and air fresheners. As with the Teflon and other fumes, scented candles, scented oils, and air fresheners can all pose a health hazard when you use them around your pet. Birds have extremely sensitive respiratory systems and are easily overcome by chemicals and fumes. No smoking in the house. Period. You guessed it -- cigarette smoke is just as bad for your bird as it is for you. (If not worse) If you do choose to use tobacco products, use them outside away from your bird to keep him safe and healthy. And don't forget to wash your hands before handling your bird if you've recently smoked! Plan on waking up early. Birds wake up with the sun or when you uncover them each morning. They are then ready to start their days bright and early. They will expect you to do the same. Be prepared to adjust your sleep schedule as needed to accomodate your feathered friend. Your bird will need his breakfast soon after waking, and you'll have to be there to serve it. Invest in a really good vacuum. Birds are quite messy to put it lightly. In many cases, you will need to sweep or vacuum daily to keep up with the constant flow of vegetable crumbs and other debris that will accumulate around your pet's cage. Be sure that you are up to this task before bringing a bird into your home. You may have to get rid of some of your houseplants. Many commonly kept houseplants are toxic to birds and could kill your bird if he injests them. You will need to find new homes for them before you adopt your feathered friend. You will need to watch what you wear. Birds are naturally attracted to shiny objects, which makes things like jewelry and sequins great targets. You will need to take these off before handling your bird, to protect yourself, your pet, and your items. Also, you should be prepared to lose many buttons to your feathered friend. It's a good idea to have some spares and a small sewing kit on hand. Owning a bird takes a lot of time. Birds are not domesticated like cats and dogs, so they have to be socialized on an individual basis. If you buy a socialized, handfed bird, you can be assured that a lot of time and effort went into shaping his little personality. 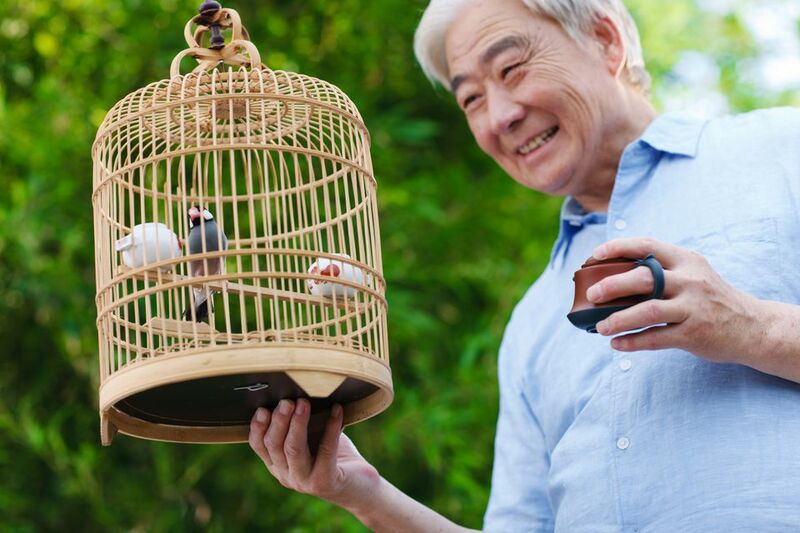 To maintain the fruits of all that labor, you have to be able to handle and interact with your bird every day. Aside from that, daily cage cleaning also takes up more time than many are willing to spare. You should be absolutely sure that you are able to devote enough time to maintaining a bird before buying one. You'll have to put up with some noise. Sure, some birds can talk, but all of them can scream, chirp, cackle, screech, tweet, or coo, amongst other things. Your bird will probably make a variety of these noises, and it may not always be at a time when you want to hear them. If you want to own a bird, you'll have to figure out a way to cope. Don't expect your bird to be a social butterfly. You may well end up with a bird that is completely socialized when you deal with him, but she refuses to tolerate other people. While there are certain species that are more prone to becoming "one person birds" than others, it can happen to any bird, particularly if only one person cares for and interacts with it. If you are buying a bird for your family, it's imperative that everyone learns as much as they can about the bird, and participates in its care and maintenence. Otherwise, your pet may decide to play favorites, which can lead to sore fingers and hurt feelings. If you are prepared to deal with all of the issues on this list and more, then a bird may be an ideal pet for you. Remember, the more research that you do before you buy or adopt a bird, the better off you and your feathered friend will be. Although it takes effort to keep a bird as a pet, the relationship that you can form together makes it all worthwhile -- just ask anyone with birds of their own, and they'll be more than happy to tell you all about it. Please remember that adoption is always a good option. There are many resources out there to locate a companion bird who is in need of a home. Please explore these options.